WE ARE PASSIONATE ABOUT YOGA AND OUR FOCUS IS YOU. Elevate Yoga is a boutique yoga studio overlooking the Bay in beautiful Black Rock. We provide a luxurious and contemporary yoga experience for our clients. Our teachers are dedicated and inspired. They focus on an enjoyable, intelligent and safe yoga practice. 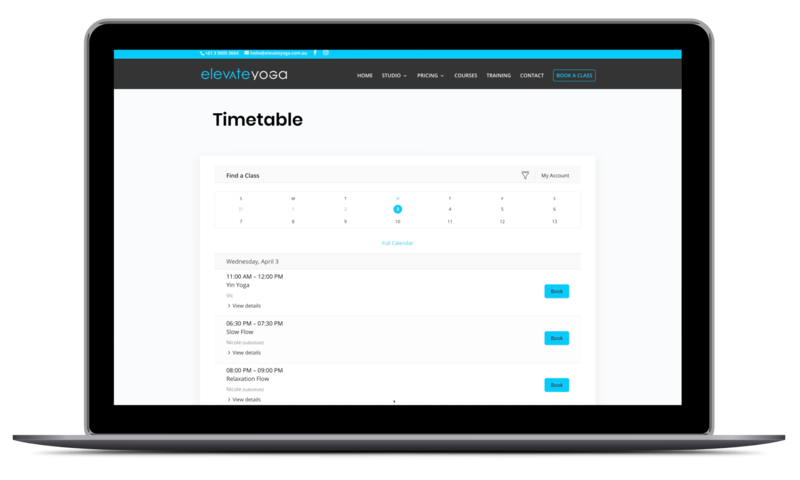 Elevate Yoga class sizes are designed for personal space and personal attention. Our yoga styles are accessible to the modern body. You can indulge your practice on cushioned bamboo floors with full-length mirrors, surround sound, the best eco-organic products and props, complimentary teas plus one of the best views in Melbourne. We want you to experience the many benefits of a regular Yoga practice – physical tone, strength, flexibility, increased energy levels, heightened immunity, well-being and a sense of calm. Yoga is for everyone, and any level. Come and experience yoga – the Elevate way – and see how we can enhance your wellbeing. As the name implies, our Slow Flow classes are slower-paced than Vinyasa Flow. Postures are generally held for longer and transitions between poses are gentler. During this class, your teacher will allow you to explore your body awareness with breath and to depend your practice, as you reap the full benefits of each pose. Our Vinyasa Flow class links breath with movement and features a continuous flow of poses, geared toward developing your strength and mobility. Poses are practiced at a higher intensity and transitions are smooth and swift. Improve your cardiovascular health, recharge and feel invigorated. Our gentlest class on offer. Yin uses floor based postures to gently stretch and release the connective tissues (fascia & ligaments) of the pelvis, hips and lower spine. Muscles are kept relaxed and Yin postures are held for 2 -5 minutes, making it a more meditative practice. This class will help you to increase circulation, improve flexibility, cultivate awareness and reconnect. Book your classes online by downloading the FREE ‘MindBody’ App on the APP STORE or GOOGLE PLAY. View our schedule, book your classes or buy class packs and memberships all with ease from your mobile!